The Internet of Things (IoT) is already making an impact on home automation and energy management systems, but many IoT sensors are placed in locations where power outlets aren't conveniently located, forcing the sensors to run on battery power. 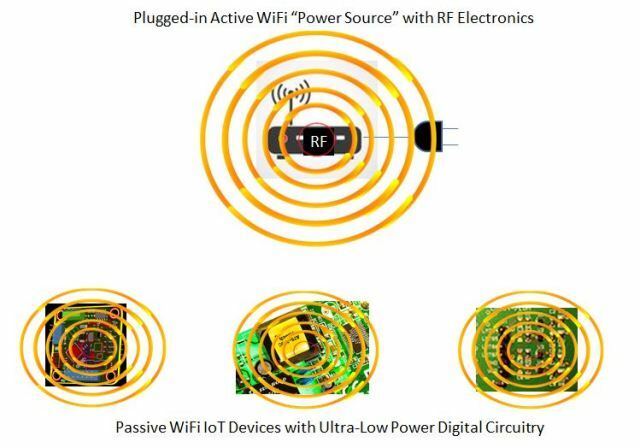 Engineering students and professors at the University of Washington have developed a way for passive IoT devices to receive energy via an RF carrier wave transmitted by an active WiFi power source. One central power source plugged into a wall outlet can transmit energy wirelessly to the passive devices, allowing sensors to send data without the need for power-hungry RF circuitry onboard. Electronic circuits are becoming more energy-efficient, especially in the digital realm. Analog circuits, specifically RF devices, haven't fared as well in that regard, mainly because it takes a significant amount of power to generate and transmit a radio signal. If you're familiar with radio frequency identification (RFID), you know that passive RFID tags take RF energy from the active reader, piggyback their data onto the RF signal, and reflect it back to the reader. This works well for very short distances and low data rates but it requires a reader with somewhat costly hardware. The U of W team wanted to increase the range and let the signal be readable by existing WiFi devices such as smartphones, tablets, and routers, so they engineered a hardware solution for passive WiFi devices using off-the-shelf components, and developed a protocol stack that allows the devices to work with existing WiFi products. As shown in the image below, a WiFi power source contains all of the high-power RF electronics. The active source sends a single frequency WiFi carrier wave in all directions. The wave is absorbed by the passive devices; when they're ready to send information to a router or other WiFi device, they modulate the data signal on top of the carrier and retransmit it. Normal WiFi products use "carrier sense" (CS) to determine whether it's safe to transmit data. Because CS circuitry uses too much power for this scheme, the designers chose to let the active source poll the passive sensors one at a time and tell them when to send information, kind of like a teacher calling on a particular student. Each passive sensor may have a maximum amount of time that it can hold onto data before transmitting it, so upon setup, the active source will poll the passive devices to determine their transmitting intervals. Like other network communication protocols, WiFi has an ACK (acknowledge) bit and error checking bits built into each data packet. Based on the number of failed communication attempts or bad packets, the active device will calculate the optimal bitrate for each passive device. When it sends a request to the passive sensor, the request packet includes the bitrate, so the passive device knows how fast to transmit data. The engineers tested their system under a variety of conditions, including line-of-sight and through walls, and were able to achieve successful communication at ranges of 30 to 100 feet (9 - 30 meters). Power consumption for passive devices varied with bit rate. At 11 Mbps, the devices used less than 60 uW (microwatts). The same devices drew a mere 15 uW when transmitting at 1 Mbps. This is a whopping four orders of magnitude (one ten-thousandth) of the power that normal WiFi uses, and three orders of magnitude (one one-thousandth) lower than ZigBee. Certain IoT products still require batteries for non-communication features; in these cases, the use of passive WiFi can extend battery life significantly. For example, a proximity sensor might use a coin cell battery which, using ZigBee or Bluetooth Low Energy, may last only three years. Substituting passive WiFi could triple the battery life. For a comprehensive explanation of passive WiFi written by the designers themselves, see the paper "Passive Wi-Fi: Bringing Low Power to Wi-Fi Transmissions." The paper gives the details of the RF scheme, the WiFi protocols, and the results of various experiments. The authors provide suggestions for active and passive device locations and optimal distances to maximize range and minimize interference. Finally, they discuss hardware solutions using off-the-shelf components for the RF processing and a field programmable gate array (FPGA) for the digital circuitry. Follow Dr. Tom Lombardo on Twitter and/or LinkedIn.